The amount of resources in terms of disk space can vary a lot according to the configured data retention for each component, the number of hosts and flows. Monitoring the space used by ntopng on disk becomes crucial to make sure you are now exceeding the expected amount of resources, and check that the automatic space reclaim facilities in ntopng have been configured properly. 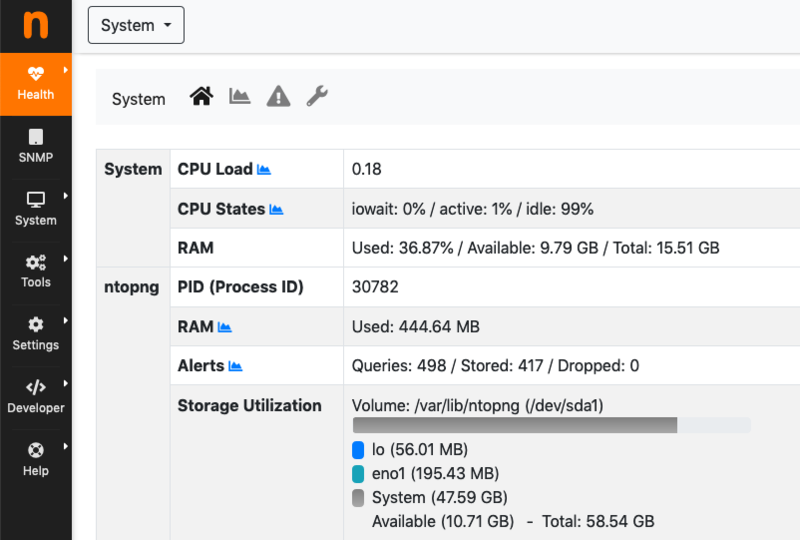 The Runtime Status page in ntopng shows the current Storage Utilization, providing the total disk space in use, and a breakdown with the disk space used by ntopng to for storing information for each interface. By clicking on an interface, you get redirected to the Interface Status page. In this page you can see the total disk space used for the current interface, and a breakdown with the amount of space used for each component (Timeseries, Packet Dumps, Flows). From the Interface Status page we can easily check if some component is using more space than expected. At this point we can move to the configuration page for that specific component, and review the data retention settings. For example, going to the Traffic Recording page, we can see what is the actual disk utilization, checking the disk space used for Packet Dumps, and we can review the configured Max Disk Space based on the amount of resources that we want to reserve for this component.